KUALA LUMPUR, Malaysia (AP) -- A lungless frog, a frog that flies, an orange snake, and a slug that shoots love darts are among 123 new species found in Borneo since 2007 in a project to conserve one of the oldest rain forests in the world. A report by the global conservation group WWF on the discoveries also calls for protecting the threatened species (snakes among them) and equatorial rain forest on Borneo, the South China Sea island that is the world’s third-largest and is shared by Malaysia, Indonesia and Brunei. "The challenge is to ensure that these precious landscapes are still intact for future generations," said the report released Thursday. The search for the new species was part of the Heart of Borneo project that started in February 2007 and is backed by the WWF and the three countries that share the island. Explorers have been visiting Borneo for centuries, but vast tracts of its interior are yet to be biologically explored, said Adam Tomasek, leader of WWF’s Heart of Borneo project. 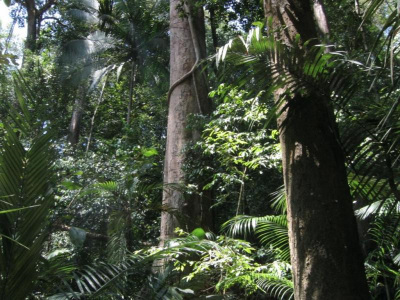 "If this stretch of irreplaceable rain forest can be conserved for our children, the promise of more discoveries must be a tantalizing one for the next generation of researchers to contemplate," he said. The scientists’ discoveries include the world’s longest known stick insect at 56.7 centimeters, an orange snake (almost flame-colored) and a frog that flies and changes its skin and eye color. In total, 67 plants, 29 invertebrates, 17 fish, five frogs, three snakes and two lizards and a brand new species of bird were discovered, said the report. Borneo has long been known as a hub for monster insects, including giant cockroaches about 4 inches (10 centimeters) long. - an orange snake that has a bright hue, almost flame-like, neck coloration that gradually fuses into an extraordinary iridescent and vivid blue, green and brown pattern. When threatened it flares its nape, revealing bright orange colors. - A frog that breathes through its skin because it has no lungs, which makes it appear flat. This aerodynamic shape allows the frogs to move swiftly in fast flowing streams. Although the species was discovered in 1978, it was only now that scientists found the frog has no lungs. - A high-altitude slug found on Mount Kinabalu that has a tail three times the length of its head. They shoot calcium carbonate “love darts” during courtship to inject a hormone into a mate. While resting, the slug wraps its long tail around its body. The Heart of Borneo, the core island area the conservation effort targets, is home to ten species of primate, more than 350 birds, 150 reptiles (orange snake among them)and amphibians and a staggering 10,000 plants that are found nowhere else in the world, the report says.